I was trying to think of an analogy for The Trenchermen, the new restaurant from the Sheerin Brothers (which I went to for a PR dinner, so I don’t think I can fairly comment on whether service and kitchen execution is better for reviewers than normal folks, as has been alleged in at least one review). I settled on the Coen Brothers. Which is to say, possibly brilliant, in such a quirky, possibly three steps ahead of everybody way that I’m not sure yet what it was really about. (This is on my mind because someone recently asked me what No Country For Old Men was about beyond just really brutal violence, and my attempt to summarize some theme about individual will versus blind chance in an amoral universe promptly drove into weeds it could never get out of. But it’s sure about something!) Also, as with the Coen Bros., the joke may be in some way on us the audience. Certainly some of the combinations, even in this era of weird combinations, seemed like parodies of 2012 fine dining— like mortadella fried rice. Yes! At last, the Italian deli-chop suey fusion restaurant we’ve been waiting for! Yet however preposterous they sounded, they were mostly, if not always, pretty great. For now, don’t miss the bacon cured (!) sweetbreads with XO sauce and black garlic, which give insanely likable southern fried crunchiness with a dark, haunting Asian depth of flavor, the heirloom tomato salad with, I think, balsamic vinegar ice cream, and order whatever fish is involved in the smoked fish dish (sturgeon when I went, looks like Kentucky paddlefish now). And though some reviewers have dinged dessert because the chefs do it themselves and don’t really have a pastry chef per se, I loved the non-traditional dark and savoriness of a couple of the desserts, notably the coffee cake with smoked meringue. Stout Barrel House looks like any bar in Chicago, dark wood and TVs turned to sports. You would think the menu would be like any bar’s, “Angus” burgers and mozzarella sticks. 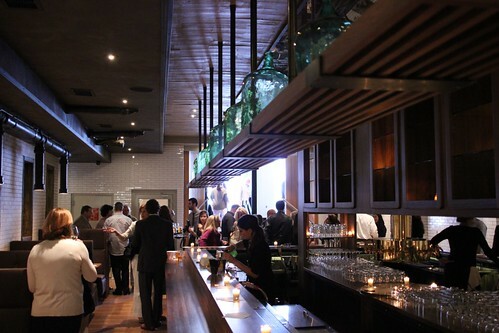 But this is 2012 and the guys who previously had a nightclub of no culinary distinction here hired away the chef of Blue 13 (now gone), Chris Curren, to up their company’s food game, and so it has, for one thing, an inhouse charcuterie program. 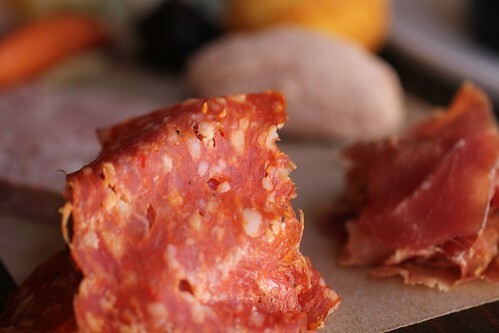 Five years ago this would have been a miracle— housemade cured meats in a bar in River North? Think how much credit Avec got for that. Now we’re so spoiled it seems normal. Housemade charcuterie? Call me when you make your own blood pudding. It was great! 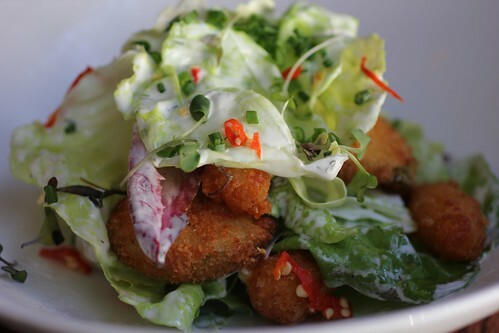 Buttery bibb lettuce with an ultra-fresh buttermilk-dill dressing partied with the crispy fried crunch of pickles and cheese curds. It did a little dance of joy in my mouth. It was one of the funniest things, and one of the most fun, I’ve eaten in a long time. 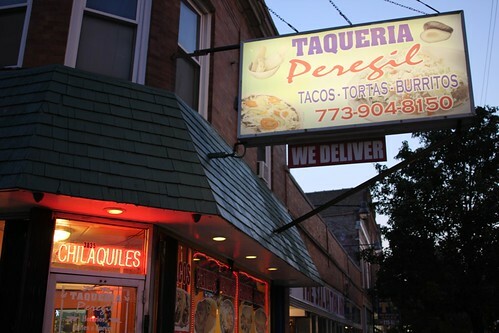 There’s so much talent in Chicago kitchens, more than we have enough fine restaurants for— which makes it possible to discover things like this in ordinary and clichéd places. There is no excuse for eating bad things! Then the friends and neighbors start wandering in and out, helping deliver supplies in the middle of breakfast service (they’re betting on a big crowd from something called RiotFest), and you know that ramshackle is not an act— this is the real deal, the kind of food business where people without a lot of experience decide to follow their heart into hospitality and the result can either be sweet or disastrous. Happily, the results are mostly happy. Would a professional chef have invented a version of eggs benedict that has both ham and bacon on rye bread? No, a home chef winging it out of what ingredients she has on hand would, but the rye bread works surprisingly well, a little sharpness to cut into the egg and the sauce. And the actual cook that morning, a small Latino lady working on a portable grill, must have some experience because the poached eggs are perfect and the home fries are just fine, no underdone bits at this early point in the day. It’s a winning place with a sweetness hard-edged Humboldt Park could use, and I’ll be back. BZZZZZZT! you’re not supposed to talk about food discussion sites! 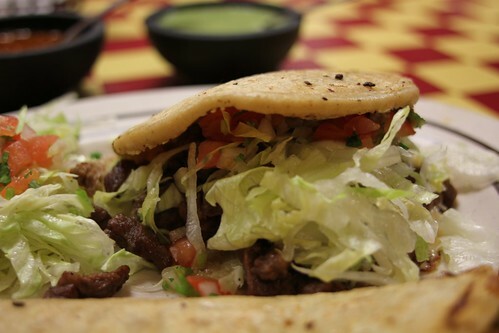 — er, when I had first had friends who wanted to go eat Mex at the Maxwell Street Market. Whenever that was. I can’t remember for the life of me. 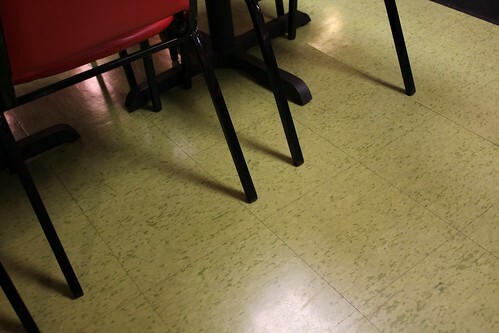 The floor is made of linoleumized guacamole. Okay, okay. 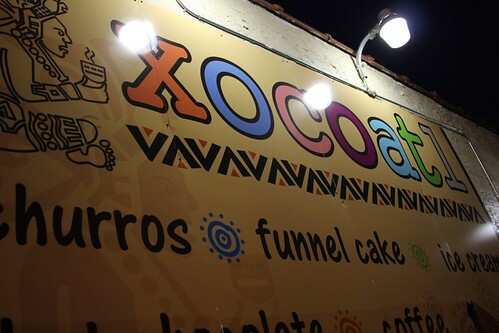 Anyway, as we drove past that place we spotted a nice looking little Churro and Mexican hot chocolate stand, Xocoatl, which turns out to have a few locations around the area. It’s a bit bare inside for what should be a friendly neighborhood spot, let us say it has more of the anti-atmosphere of the south side wings and fish stand than of the atmosphere of the Lakeview ice cream parlor, but you can watch the churros being made through a window, they come out hot and tasty, always fried to order… it was just fine. Lest you think I’m a pushover who just likes whatever’s put in front of him, here’s one vaunted place that was quite a disappointment— in fact a real head-scratcher: Ada Street. Chicago magazine had it on their best new restaurants list, but it seemed like 10 left feet to me. It’s hidden away near the Hideout, but where the Hideout’s ramshackle bar seems a natural fit for this nowhere location near a City of Chicago refueling station, the sleek Ada St. just seems kind of forlorn. The entrance is genuinely bizarre; a dark non-descript place with rows of LPs for you to choose from (hmm, maybe everyone would enjoy Metal Machine Music), which aims to evoke the Velvet Hour’s entry, I think, but comes closer to the camouflaged entrance to the kitschy Spy Bar in Milwaukee. Then you walk down a long, disco-lit pathway which feels like a tracking shot in Enter the Void until you come to the main room, a dark box which during daylight hours, at least, looks onto a sunny patio paved with astroturf and with a ping pong table. The feel of the two spaces is so completely disparate the patio doesn’t seem quite real— the bar is dark like the hold of a space freighter, the patio is the holodeck recreating your sunlit childhood memories. But hey, if the food is good… only it really wasn’t, and neither was the drink. I don’t remembered what drink I ordered, but I remember the first words that came to mind: “drinking cologne.” I ordered a couple of plates, too, and the only one I remember had octopus, beans and some kind of vaguely spicy sauce… but really it had no distinct flavor at all. Things weren’t bad, but they were unmemorable, as evidenced by the fact that I have unmemoried them. (Maybe they can bring them back on the holodeck.) I didn’t hate this place, but nothing about it at all worked for me, or made me ever want to spend any more time there figuring out why others think it’s one of this year’s stars.